What is a Celebrant? Certified Life-Cycle Celebrants are trained professionals who specialize in creating and officiating ceremonies that mark the milestones in peoples’ lives. We officiate all types of ceremonies, including weddings and commitment ceremonies, baby namings and adoption ceremonies, birthday celebrations, and any life event you would like to commemorate. Our mission is to create a ceremony that reflects you — your beliefs, cultural background, values, and tastes. 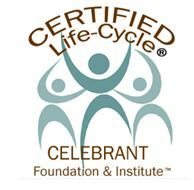 To learn more about Life-Cycle Celebrants, click here to visit the Celebrant Foundation and Institute. How are Celebrants different from other officiants such as judges or ministers? By having a Celebrant ceremony, you are completely empowered and in control. Nothing is imposed on you; there are no cookie-cutter ceremonies. I'll meet with you in person, and give you a questionnaire to complete and email back to me. I'll use your responses to the questionnaire to incorporate your story into the ceremony. With your input, I'll help guide you in choosing rituals, reading symbols, and elements to make your ceremony exactly as you wish. This is a collaborative process and I will consult with you until the ceremony has your 100% approval. What if I’m not religious? Can we have a completely secular wedding? Definitely! The ceremony is about YOU -- it should be a reflection of your personality and ideals. You can have a beautiful, meaningful ceremony that does not include any religious elements or references. Remember, it's your wedding and it should be your way. My partner and I come from very different backgrounds – will that be a problem? Absolutely not! When multiple faiths or cultures are brought together in a wedding, the ceremony is a perfect opportunity to celebrate and honor each heritage. Your ceremony can include rituals and elements from both backgrounds, highlighting their importance in your union. I can work with you to discover ways to incorporate your faith and/or culture in your wedding. Can I have a theme wedding? Many couples like to incorporate a theme into their special day. If this is your desire, we can make it happen. Anything from a wedding in the woods of Merry Olde England to a Halloween Masquerade Ball to a tropical-themed island wedding -- wherever your imagination takes you, I can help you make it a reality. Can I write my own vows? Writing your own vows can be a wonderful experience, and will be a beautiful part of your ceremony. You are welcome to do it all on your own, or I can help you to create your vows. If you'd prefer not to write your own vows, I can offer suggestions for vows that are meaningful and can be personalized in any way you desire. Can we pick what goes into our ceremony? Absolutely! There are so many lovely wedding rituals to incorporate in a ceremony! Would you like to include traditions from your ethnic background? Would you like to “borrow” a ritual from another culture and re-imagine it to fit your personality? Anything is possible! If I am not familiar with a particular ceremony element, I’ll do the research for you. Not sure about what you want? I can help you come up with ideas. It’s YOUR wedding and it's my role to help you make it all about YOU! How do I get a marriage license? You must apply in person for a marriage license at the county clerk's office.